This year's special deal from Pavtube Studio to celebrate the coming Easter Sunday is to help you create the unique Easter memories and share with family members on this holy day. Like us on Pavtube Facebook Easter page and you could get a 30% discount for Pavtube Blu-ray Ripper(Windows or Mac), you can save $14.7. This promotion starts on April 18 and ends on April 25. Then you would have an opportunity to own such a professional yet easy-to-use BD/DVD ripping tool and memorize the Jesus Christ with movie enjoyment. Pavtube Blu-ray Ripper (Get a Mac Version) is a piece of BD/DVD software with the ability of copying the entire disc with original BD/DVD structure preservation as well as ripping BD/DVD to any other video and audio format with fast speed. With this tool, you could complete the Blu-ray and DVD ripping process within few clicks. To import source movie, remember to insert original disc into the disc drive, hit on the “Load Disc” button, and then successfully load BD/DVD disc. Next step is to choose preferred audio stream, subtitle track and optimized output format. Select the desired language and subtitles from the drop down list of Audio and Subtitles on the main UI, and check in the built-in preview window. Then search the best supported video type for your device from the “Format” list. You could either choose as the video format, like MP4, MKV, AVI, M4V… or find the mobile device including iPad, iPhone, Apple TV, Samsung, HTC, Google Nexus, Nokia, etc. for output. What's more, you can create your own movie experience by freely adjusting profile parameters and editing movie with the video editor. Optionally set video codec, video size, bitrate, frame rate and more in profile settings, you could achieve the better video and audio quality during playback. 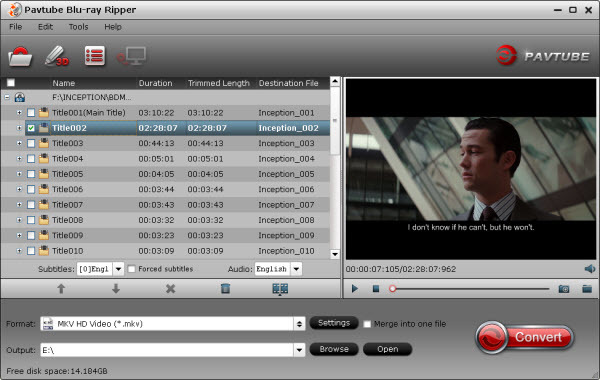 Plus, with the help of video editor, you are allowed to trim, crop, split, merge, attach subtitles, add video effects before conversion. This program could even support 3D video creation. 3D conversion is to help users to get a vivid 3D movie out of 2D/3D Blu-ray or DVD in Side-by Side, Red/Blue, and Top/Bottom effect. Start BD/DVD ripping process by clicking on the “Convert” icon, and you would soon get a ripped file in output folder. Then transfer this movie to your device and you could watch Easter Sunday movies on the move. Pavtube Blu-ray Ripper for Win/Mac costs $49, but Pavtube Studio puts it on sale with 30% off to show our gratitude. To win this 30% discount all you need to do is follow AND Like us on Facebook. If you have friends who are interested in Blu-ray Ripper or other Pavtube programs, free to join in Pavtube fans page on Facebook and get 30% or other discount. How to play Blu-ray movies with VLC Media Player for Mac?